Charles Thomson: "I had Michael Jackson on my knee at 10 years old!" "I had Michael Jackson on my knee at 10 years old!" One of the best things about my job is that it brings me into contact with a lot of interesting people - from Lords of the land to legends of the music industry. 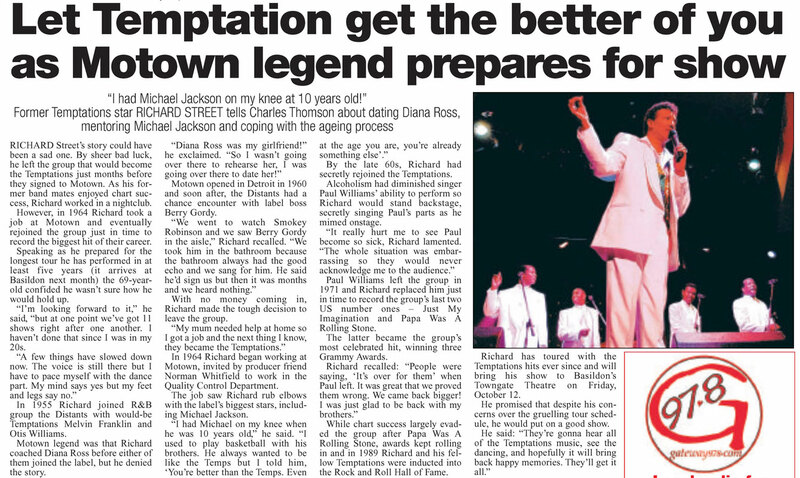 Last week brought me into contact with one of the latter - former Temptations singer Richard Street. Richard, who will be 70 years old next week, is currently on an extended UK tour and will soon roll up in Essex. As such, I managed to wangle a 40-minute telephone interview to promote his upcoming gig. During our chat he told me an extremely condensed version of his life story - and it was truly inspiring. Richard's story could have been far less inspiring. It could have been deeply tragic. In fact, he could have become Motown's answer to the Fifth Beatle - for in the early 1960s, after having been a member of Detroit vocal group The Distants for a number of years, Richard was forced to quit the band in order to help support his mother. Months after he left, the Distants were signed to Motown and rechristened the Temptations. As his former bandmates shot to fame, Richard worked in a nightclub. But, determined not to be left behind, Richard soon found his way into Motown, invited by producer friend Norman Whitfield to join the company's quality control department. There his job was to listen to all the artists' cuts for any flaws in the recordings. If he found any, they were re-recorded. If he didn't, they were passed to Berry Gordy and the other label heads, who would decide which were worthy of release. The job also brought Richard into contact with the label's stars, from former girlfriend Diana Ross to future King of Pop Michael Jackson, who Richard recalled mentoring and playing basketball with. By the early 1970s, Richard had worked his way back into the Temptations, just in time to record what would become their most critically acclaimed song: triple-Grammy winner Papa Was A Rolling Stone. He and his bandmates went on to win several American Music Awards and were later inducted into the Rock and Roll Hall of Fame. Editing for newspapers is a ruthless business. The article has to be chopped until it fits into the space available on the page. As such, my 40-minute interview was trimmed to just 600 words. Perhaps I will upload an extended cut onto my website soon. In the meantime, though, here's the published version. Click to enlarge.